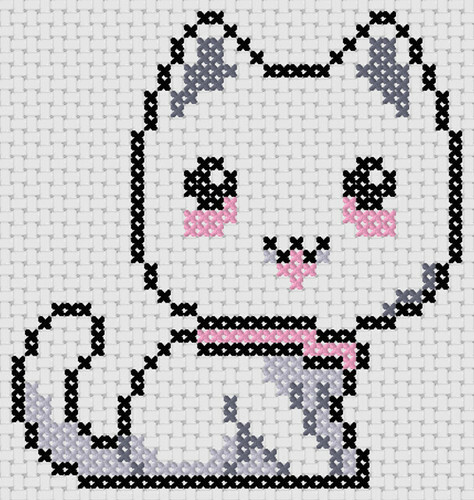 This is one of our cross stitch easy pattern called Cat Anime. This simple pattern is part of our special 40 Stitch Or Less collection, and is also perfect for your mini crafts projects such as greeting card, bookmarks, coin pouches, decorations, and many more. Each of our pattern conveniently includes a color key and sheet. If you use one of the free cross stitch patterns from CrossStitch4Free.com for a project, feel free to contact us and include a picture of your completed project to be included in our web site. Click the Download link below and save it into your computer. All our cross stitch patterns and charts are in a zipped file format and requires a password to unlock it. If you are looking for free cross stitch charts, contact us with your idea and we’ll see if we can help you. Download this cross stitch easy pattern zipped file (approx. 192kb — downloaded 224 times). The password for this download is “crossstitch4free” without the quotation marks. Our small and simpler cross stitch patterns can be perfectly combined with our cross stitch alphabets charts. Just use our Search form on the top of this page, and search for alphabets. Take the time to subscribe to our updates either via e-mail or RSS feed (link can be found at the bottom of this site) to get instant reminders of the many more free cross stitch patterns we have in store for you. Please send us a message via our Contact page immediately if you find any problem with our site or cross stitch design downloads.